Manchester City take on Watford at the Etihad Stadium on Saturday in the Premier League. City are yet to lose a game to Watford in the Premier League and come into this match on the back of five successive league victories. Pep Guardiola's men have established themselves at the top of the Premier League table by toppling Liverpool, with the Citizens currently being one point and a place ahead of the Reds. Watford will head into the game on the back of a 2-1 victory over Leicester City last weekend which is sure to boost the confidence of Javi Gracia's men. Although City are the favourites to win this fixture, there is no telling what kind of surprise the Hornets might spring upon them at the Etihad. 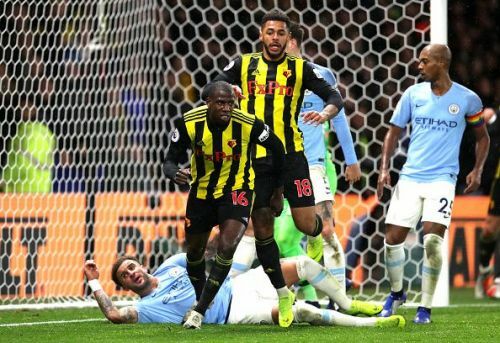 Manchester City have had two huge victories over Watford in the recent past, one of them being 5-0 and the other 6-0, and that will give the Citizens a huge morale boost. They will be keen to avoid any slip-ups as they look to cement their place at the top of the Premier League table. City presently have 71 points, while they are being chased by Jurgen Klopp's Liverpool, who are at 70. Watford are placed eighth in the league table with 43 points and they will be looking to gain ground on Wolverhampton Wanderers, who are seventh with the same number of points. For Manchester City, Sergio Aguero has been in brilliant form and he will be their key man up front. Assisting him on the flanks will be Raheem Sterling and Bernardo Silva. With a fit Kevin de Bruyne back in contention, City's midfield look rock-solid. Giving De Bruyne company will be Ilkay Gundogan and Fernandinho. Troy Deeney has been in a purple patch for Watford and he will be looking to cause trouble to City centre-halves Aymeric Laporte and John Stones. Gerard Deulofeu and Etienne Capoue have been magnificent for the Hornets as well. Attackers: Raheem Sterling, Sergio Aguero, Bernardo Silva. Attackers: Troy Deeney, Gerard Deulofeu.